Our school promotes physical activity throughout the school day, weeks and year to help us have fun, get active and become fitter and healthier. As part of our Active School journey we have completed many extra initiatives, some of which are named below. A look back at the work of our active school initiatives last year. Our school yard is zoned for different classes to make the most of their play spaces. We have playground leaders to assist with the younger classes, encouraging them to become more active during break times by using different equipment and helping them play certain games. 4 square is a bit hit on yard at lunch times in our school! We also enjoy using the playground markings and playing ball games. If it’s a rainy day we remain in our classes for break time. 6th class supervise the classes along with the teachers. We promote Go-Noodle and Bizzy Breaks as means of getting our exercise in. We use physical activity reward charts in our school also. Classes can earn physical rewards for good behaviour. At certain times, active homework replaces written homework too. 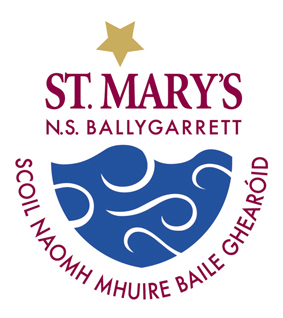 We enjoy all our physical activities in St. Mary’s and try use promote our slogan in doing so. Look at all our happy faces! Active Arnie is our active mascot in our school. Junior and senior infant boys and girls bring Active Arnie home for one night each at at time and complete some activity with Arnie. Then then document it in their journal. Arnie has done some wonderful activities in the last year. Our achievements within the school don’t go unnoticed. We announce them at assemblies, on our student council radio station and write them in our achievement diary. IF YOU WANT SOME FUN, BE AN ACTIVE ONE!